Figure 1. 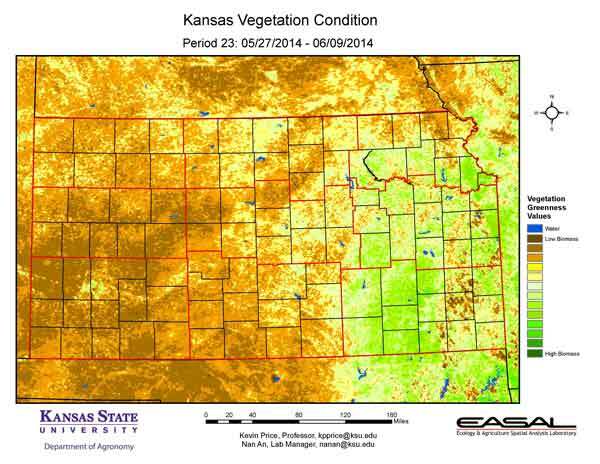 The Vegetation Condition Report for Kansas for May 27 – June 9 from K-State’s Ecology and Agriculture Spatial Analysis Laboratory shows that the most active vegetation is in the eastern third of the state. There are areas of decreased activity even in that region, however, particularly in Neosho and Allen counties, where saturated soils have been a problem. Figure 2. 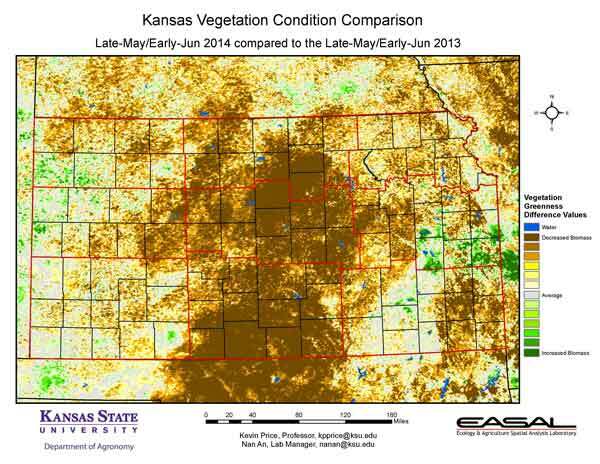 Compared to the previous year at this time for Kansas, the current Vegetation Condition Report for May 27 – June 9 from K-State’s Ecology and Agriculture Spatial Analysis Laboratory shows that east central Kansas has had more favorable conditions. In contrast, most of central Kansas has much lower vegetative activity. This is due to a combination of freeze injury and drought damage. Figure 3. 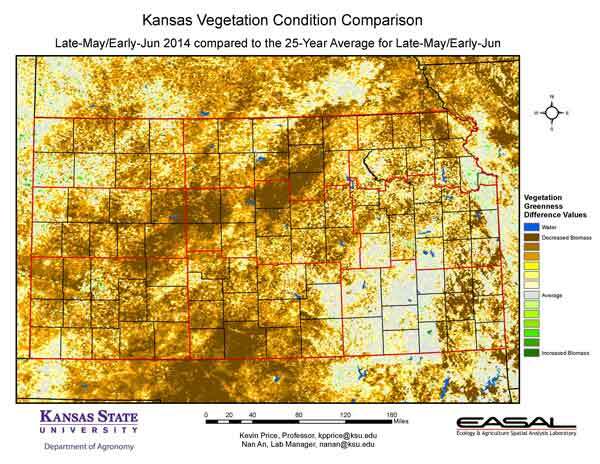 Compared to the 25-year average at this time for Kansas, this year’s Vegetation Condition Report for May 27 – June 9 from K-State’s Ecology and Agriculture Spatial Analysis Laboratory shows most of the state with much-below-average vegetative activity. In general, the vegetation hasn’t had time to respond positively to the recent rains, and in some locations excessive moisture has created additional problems. Figure 4. 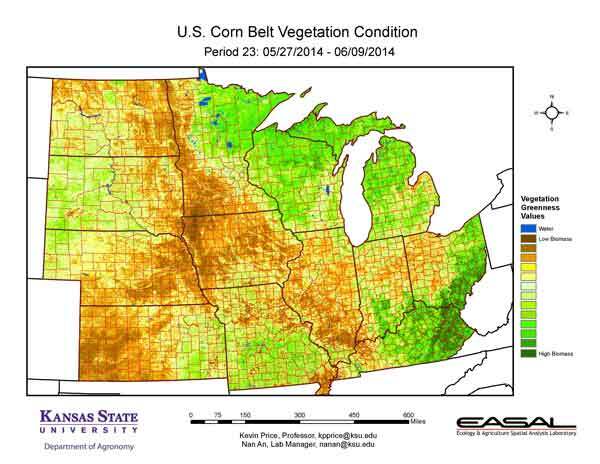 The Vegetation Condition Report for the Corn Belt for May 27 – June 9 from K-State’s Ecology and Agriculture Spatial Analysis Laboratory shows that vegetative activity continues to increase. The greatest level of activity is in the eastern portions of the region, where favorable moisture and temperatures have been the rule. The northern Great Lakes region has also seen an increase in vegetative activity as temperatures warm. Figure 5. 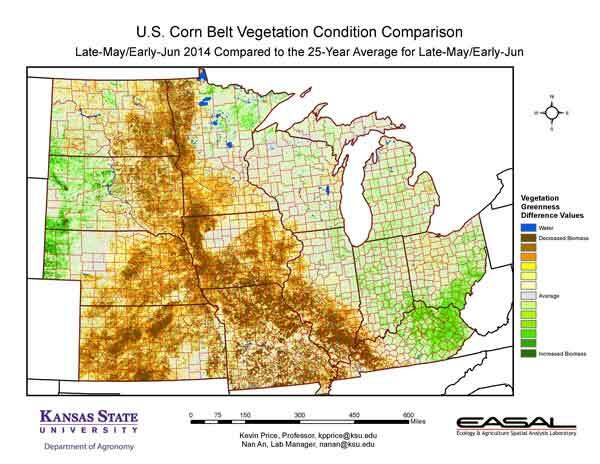 The comparison to last year in the Corn Belt for the period May 27 – June 9 from K-State’s Ecology and Agriculture Spatial Analysis Laboratory shows that the greatest increase in vegetative activity has been in the northwestern portions of the region. Favorable temperatures and moisture have greatly benefited the vegetation in those areas. In North Dakota, 81 percent of the range and pasture is reported to be in good to excellent condition. In Kansas, however, only 22 percent of the range and pasture is reported in good to excellent condition. Figure 6. 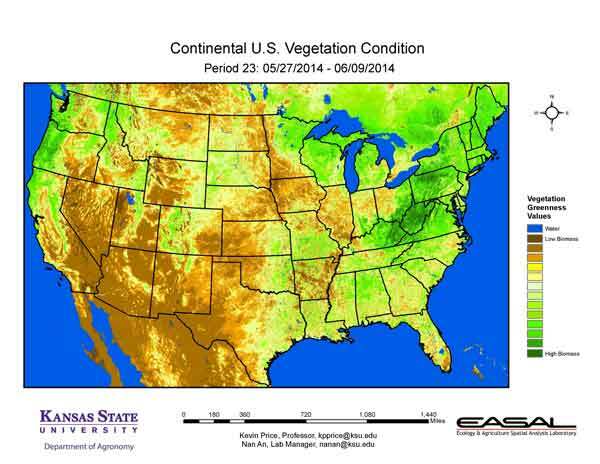 Compared to the 25-year average at this time for the Corn Belt, this year’s Vegetation Condition Report for May 27 – June 9 from K-State’s Ecology and Agriculture Spatial Analysis Laboratory shows that the center of the region has much-below-average vegetative production. This is due to a combination of drought and freeze to the south and cold, wet conditions to the north. Figure 7. 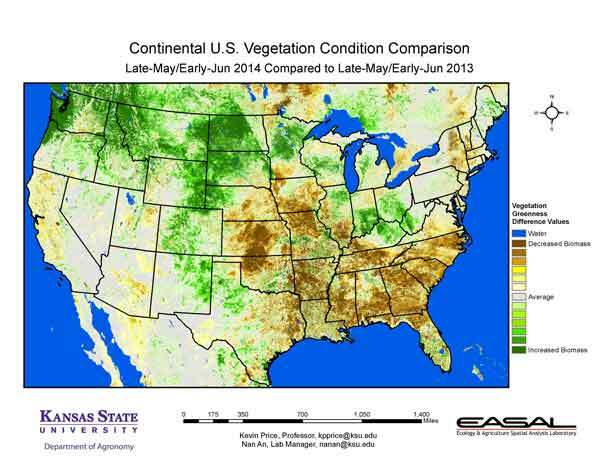 The Vegetation Condition Report for the U.S. for May 27 – June 9 from K-State’s Ecology and Agriculture Spatial Analysis Laboratory shows that Arkansas stands out with lower vegetative activity than most of the South. Extended rainfall has created problems in the state, delaying field work and planting. For the state, topsoil moisture is reported to be 54 percent surplus and subsoil moisture is reported at 34 percent surplus. Figure 8. The U.S. comparison to last year at this time for the period May 27 – June 9 from K-State’s Ecology and Agriculture Spatial Analysis Laboratory shows that much of the Northwest has higher NDVI values, while the South has much lower NDVI values. The increased vegetative activity is also noteworthy in eastern New Mexico and the Texas Panhandle. Some stations in these areas reported more rain in the last month than in the previous twelve months combined. This has allowed for improvement from exceptional drought to severe drought in the area. Figure 9. 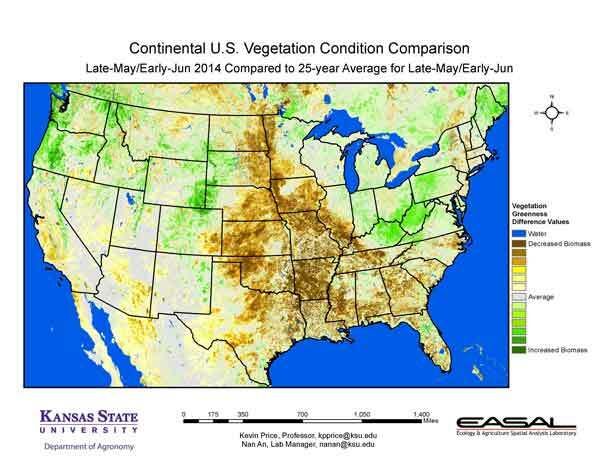 The U.S. comparison to the 25-year average for the period May 27 – June 9 from K-State’s Ecology and Agriculture Spatial Analysis Laboratory shows that the main area of below-average vegetative activity is concentrated in the center and south of the country. This is a result of a complex combination of excessive moisture to the southeast, drought to the west, and cold to the north.